Sat., Sept. 23, 2017, 11:36 p.m.
MISSOULA – These are the kind of Saturday night memories that will last a lifetime. 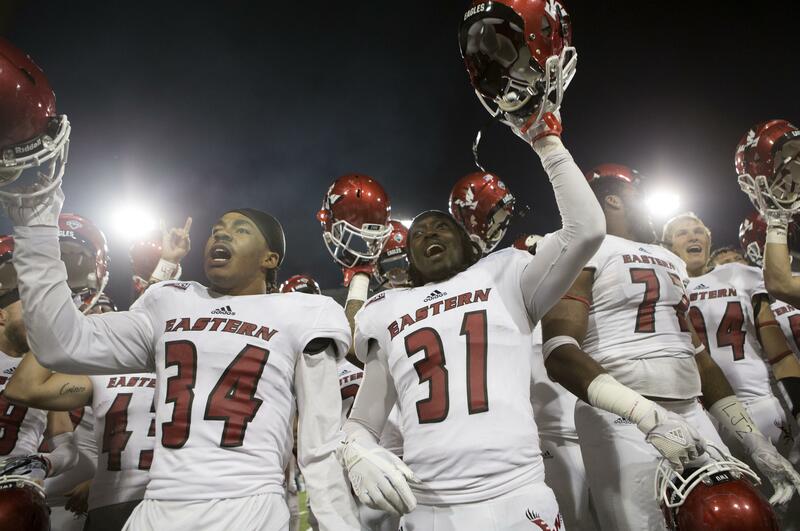 Eastern Washington’s 48-41 win at Montana was that good. At midfield, Eastern Washington coach Aaron Best hoisted his daughter Texis on his shoulders while his family beamed. His coaches exchanged bear hugs until they ran out of partners. The players were physically drained but found enough energy for two renditions of the fight song with their fans, the ones who stuck it out on a long, chilly Saturday night that initially looked destined to end in another loss at Washington-Grizzly Stadium. But it didn’t. Fighting uphill all night, the Eagles finally overcame the crowd, the Grizzlies and their own self-doubts to claim an exhilarating win – only EWU’s third in the last 20 years in Missoula. “I’m just so happy for our players for overcoming so much,” Best said after his first Big Sky Conference game as a head coach. “We had guys going down with cramps, we had turnovers and penalties, and didn’t have great results in the first 30 minutes. But in the next 30 minutes it was like we tore a mask off and we were a whole new team,” Best said. Against a Montana team with low expectations, this game was Eastern Washington’s for the taking. But for most of a chilly night, the Eagles seemed to say “no thanks,” with momentum-killing penalties, busted coverages and plain bad luck. Finally, the Eagles seized the momentum by the throat, riding a record-breaking performance by quarterback Gage Gubrud to an unlikely win at a venue where Eastern had won just twice in the previous 20 years. Down by three scores at halftime and by 14 late in the third quarter, Eastern turned the game around with two touchdowns in a span of 21 seconds and never let up on the gas to improve to 2-2. Montana regained the lead, 34-27, early in the fourth quarter, but Eastern responded with a trio of touchdown drives to send a sellout crowd of 25,944 home early. Eastern tied the game at 34 on a 12-play, 73-yard drive that was all Gubrud: five straight completions and a nifty third-down scramble for a makable fourth-and-2. A pass interference penalty set up Gubrud’s 2-yard end-around for the score. After a Montana three-and-out, Eastern took a 41-34 lead on a six-play, 58-yard drive capped by Gubrud’s 3-yard touchdown pass to Nic Sblendorio. Proud, too, of the defense, which gave up 538 yards in the game – but only 237 in the second half. “We knew at halftime that we had to play more physical,” roverback Cole Karstetter said. Leading 41-34, Eastern got the ball back on downs at the Montana 20-yard-line, and a pair of 10-yard runs by Antoine Custer Jr. made it 48-34. Montana scored with 48 seconds left, but the onside kick was out of bounds and Eastern began to celebrate. Eastern struck first, marching to the Montana 27 before stalling and settling for Roldan Alcobendas’ 39-yard field goal midway through the first quarter. Montana took the lead when quarterback Gresch Jensen found a wide-open Keenan Curran for a 68-yard completion to the EWU 4. Two plays later, Jensen ran 2 yards for the score. Things got worse in a hurry for Eastern, as Gubrud fumbled on the next offensive play and Montana recovered at the Eastern 32. Montana capitalized in four plays, as Justin Calhoun scored from the 2 to put the Eagles in a 14-3 hole. Needing a response, Eastern answered with a drive that typified the night. Starting from his 32, Gubrud hit Webster for 5 yards, lost 8 on another sack and then ran for 9. That wasn’t enough for the first down and the Eagles were forced to punt. Montana didn’t take full advantage this time, settling for Brandon Purdy’s 24-yard field goal two minutes into the second quarter. Eastern mixed things up on its next drive and had first down at the Montana 17 before a personal foul and a sack forced a field-goal attempt that Alcobendas pushed wide right from the 40. With a chance to regain some momentum, the Eagles moved from their 48 to the Montana 4 – then failed to finish the job. A short gain by Sam McPherson and two incompletes set up Alcobendas’ 23 yarder to cut the deficit to 17-6 with just 45 seconds left. That was just enough time for Montana to move to midfield after an Eastern penalty. On the final play of the half, Jensen’s Hail Mary found Justin Calhoun for a 44-yard completion. Several Eagles were in position to make a play – the ball passed inches from Nzuzi Webster’s outstretched hand – but the ball fell to Calhoun as he fell backward into the end zone. Published: Sept. 23, 2017, 11:36 p.m.